Hey all, if you have a full lesson to do this activity - you can use my worksheet that goes with the PowerPoint. 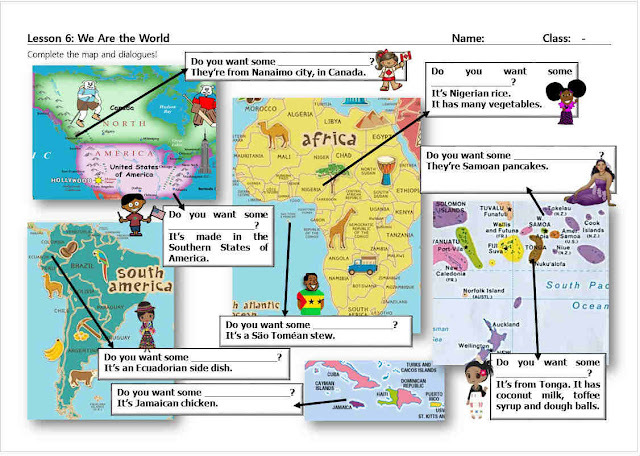 I know some of us will have to fit We Are The World with a check up or review, but if you have the extra time, it's a fun worksheet that they can read and write in while you are doing the PPT, stop at every appropriate countries. I didn't do Italy, India or Vietnam as they already know those nations and foods quite well. So here's what it looks like, it prints in black and white well, too. You can download it free on my Teachers Pay Teachers page. Click here.